AFRO SIMBA is a 7 year old Afro-Fusion band that hails from Kenya. Their music comes from Jazz and the music of 9 coastal tribes off the coast of Kenya, collectively called as Mijikenda. Their album Pandizo and the bands original take on the genre will redefine and reintroduce Mijikenda music to the world at large. The band leader Kombo Chokwe started his career in 2005 as a multi-talented instrumentalist and vocalist who has performed with Kenyas most prominent musicians. Among them are Eric Wainaina, Suzzane Owiyo, Sauti Sol, Abbi, Hellon, Winyo and Maia von Lekow. Kombo has toured Morocco, Nigeria, Mozambique and Europe as a lead guitarist, bassist, and percussionist for various bands & artists. J’s Fresh Kitchen accepts reservations so please make a reservation for a table should you know you will be coming for dinner. 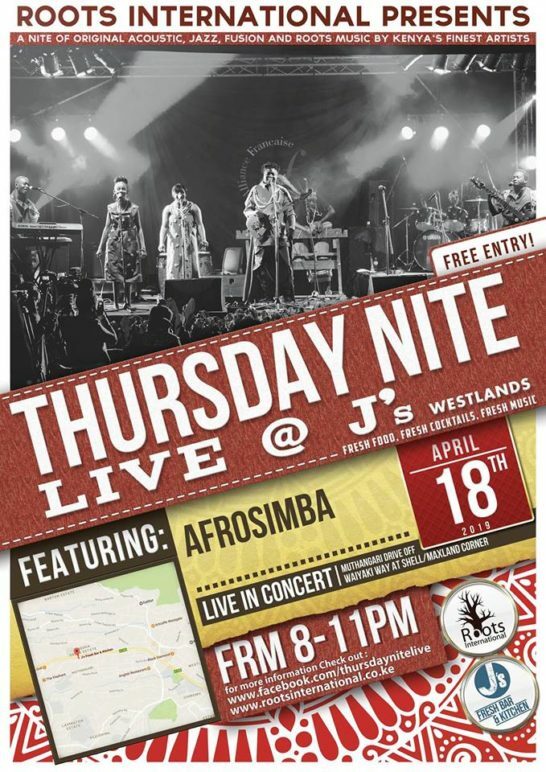 J’s Westlands is a 23 years and older venue.